Tripod Mounted Rifle Clamp/Rest Recommendations? 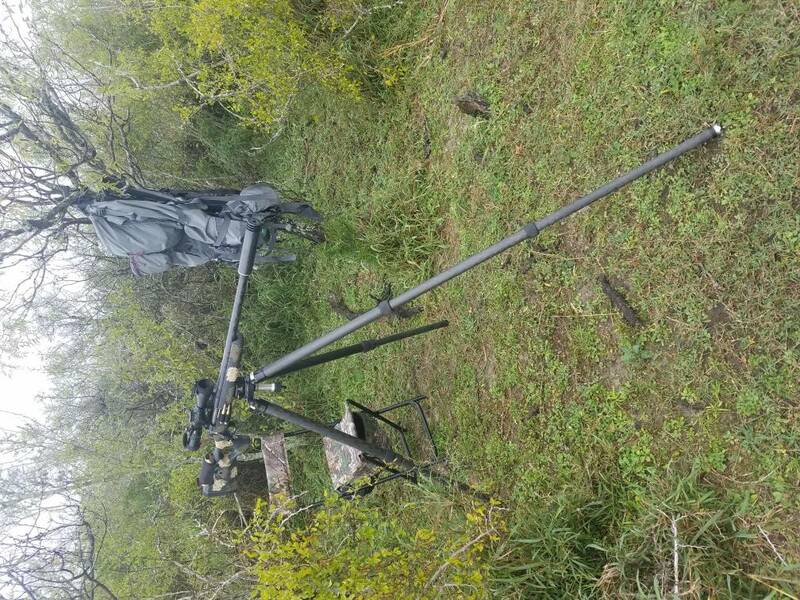 I am looking for a rifle clamp system to go on my tripod for standing shots over brush both for hunting and target shooting. I have looked at the Hog Saddle and TriClawps setups, but wanted to see if anyone has any other ideas. I like the screw down type clamps for a more positive hold rather than the spring tension varieties out there. Any likes dislikes about either of those or the setup you are using? I had also thought about the Magpul Mlok attachment right to my manfrotto head, but would have to add an MLok rail to all my rifles which doesn't help. I went with the Really Right Stuff Vyce on a Two Vets Sporting Goods No Name Tripod. This is a screen grab from a video of us letting a kid use it for his first deer. It will also hold big precision rifles. I tried the Triclawps and found I prefer my Outdoorsmans rifle rest. It is steady enough for my use and quicker to set up or get out of. I shot a moose at 300 yards kneeling and a whitetail at 379 yards sitting this year from it. I have a rifle with an ultralight stock that I worry about clamping too. They say not to shoot it from a lead sled for example so I don't know that clamping it is the best idea. Hate to screw it up a long way from civilization. It is a tank. I was vacillating between the HOG saddle and this, and don't think either was a bad choice. I do a bit of long range competition and figured for the price difference, I'll try this one. Haven't found a gun it won't hold, including shotguns. I'll give another vote to RRS although I use them directly clamped onto an arca swiss railed plate, which may not be quite what you're looking for. I have however never seen anything as stable as an attachment like this. Kopfjager Industries Reaper Rest. They're usually out of stock though. Rrs is awesome but for the value triclawps is where I went with no regret. I have a Pig Saddle. Heavier than the Hog but it also costs about one third the price. Are you guys using these for hunting? Competition? I use mine for competitions, ringing steel, and for new hunters. I have a home made hog saddle. Works well. Clamps and holds strong. Just got 3 pcs of alum bar stock and went to town on the drill press / angle grinder. Cerakoted it FDE. That looks good. Is it .5"x3" bar stock?